Battles, bunnies, and BOMBS! 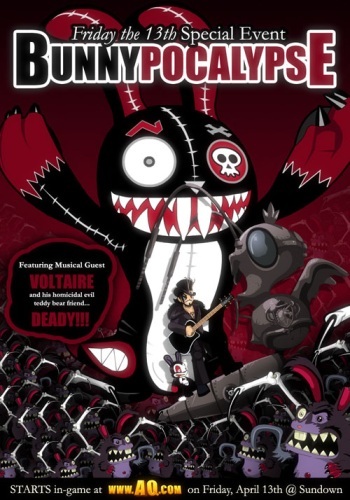 Be prepared, because THIS time Voltaire and Deady return to face down an inter-dimensional evil bunny hoppin’ into Lore… with an army of Bunny Clone minions! In this explosive event, you’ll need to crack some eggs and break some heads if you want to stop the Secret Weapon’s timer and save Lore from the Bunnypocalypse! Don't forget to visit our the epic Event Page! Featuring instrumental versions of tracks from Voltaire's last album and his latest song "BUNNYPOCALYPSE", voiceacting by Voltaire and Art, this event has quests that will keep you hoppin', a story crazier than any we've yet done, and egg-streme event rewards! These epic event rares leave on April 30th, so if you don't want to count your rewards before they're /equipped, make sure to grab them from the shop and battle until they drop! 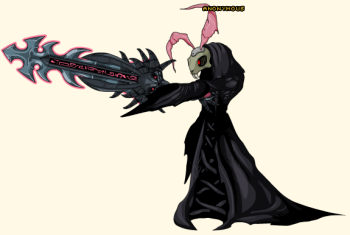 You know you want to /equip this DoomBunny armor and /stepdance. With a shop full of rabid rabbit-themed gear and even MORE rockin' rewards dropping off of Sleezter Bunny, this Friday the 13th could be your luckiest yet in terms of loot! Top of the horning to you! The Rare Shop will go rare but the event is a part of the game forever! Take your own Sleezter Bunee Home! HeroMart is now selling a selection of Voltaire's new 5' vinyl toys based on Deady Bunny and Sleezter Bunny seen in THIS EVENT! Each of the toys comes with a code that will unlock SIX NON-MEMBER PETS in AdventureQuest Worlds! Every time Voltaire has given us a limited amout of his toys to sell, we always sell out of them and we sell out faster and faster each time. At this time HALF of our supply of these toys is already gone. If you want one, ACT NOW! The Limited Quantity Shop is GONE! 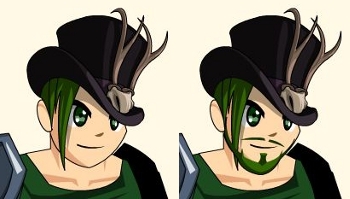 But if you act fast, you can still get your Grenwog and Lucky Day Fair gear including the Evolved Leprechaun Class in Itzachi! Hurry, though, they leave on Monday! Jack Rabbit uses Soul Crusher on Sleezter Bunny. The Final Golden Cheezburger is NOT the Golden Cheezburger Deluxe! We've had a lot of confusion about which Cheezburger turned into Knave1's Interfector Deorum armor. Many of you have the GOLDEN Cheezburger in your armor, but that was for the Aussie Opera House (which is now rare). 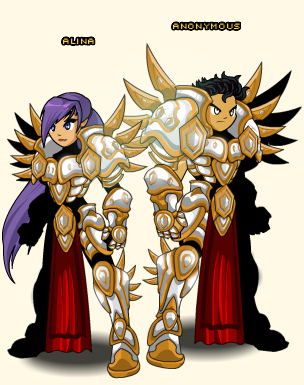 If you bought a FINAL Cheezburger, then you NOW have the Interfector Deorum armor! Hope that helps clear things up. Suggested by YOU guys, designed by Mido, AE's graphic designer, and remade in Flash by Solrac, we hope you enjoy the weapons Mido drew in Wednesday's in-game Livedraw event! Join us next Wednesday for Thyton's in-game drawing event! 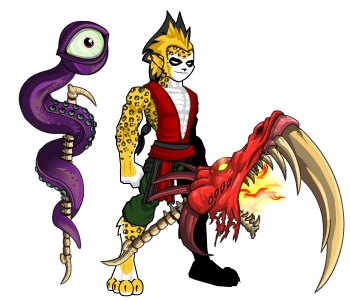 The Tentacle Staff and the Dual Flaming Dragon Scythes. Grenwog's Grenlich Pet is live! From a Diamond Grenwog Tooth, an undead GrenLICH hatches! What pet will the Grenwog drop NEXT year? Give us your ideas on Twitter and the Suggestion forum! 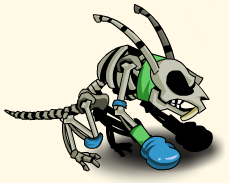 Make no bones about it, this is an awesome Grenlich pet! We're at Khaotic Kon this weekend! If you want to come hang out with some of the members of the AE team, we'll be at the KhaoticKon in Tampa this weekend! We have an Artix Entertainment panel at 1PM... and that nefarious Chairman Platinum has booked the panel RIGHT AFTER ours! Devious! Have a GREAT Friday the 13th (/knock on wood), don't break any mirrors (/throw salt over your shoulder) and if you have a black cat at home, definitely don't put its cat-bed under a ladder. See you on Monday!